Dan Reeder shocks by freely singing what’s on his mind. In an era where rock stars hang from trapezes and perform, wear outrageous outfits that cause one to look twice for the pants, and use synthesizers to amplify and distort their voices, Dan Reeder is truly shocking. Reeder does this simply by freely singing what’s on his mind. He’s not worried about offending anyone. He must know that he does, whether he’s complaining in doo wop harmony that his girlfriend won’t satisfy him on his birthday or electronically whining we are a nation that ignores the famines and wars broadcast on the news while we fall asleep with the television on. However, it’s more than that. 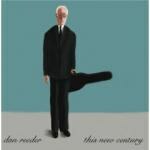 Reeder inventively creates his own musical instruments and croons his own harmonies. He’s the eccentric crank doing stuff in the garage or down the basement who makes us wonder if he’s building bombs or hiding corpses. Fear him at your peril because it’s harder to find an honest man (and a real musician) in this new century than in Diogenes’s time.